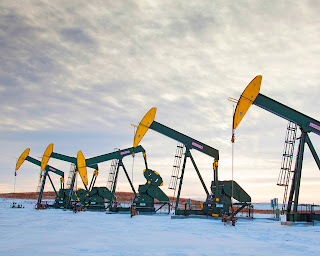 The EERC is working with the Department of Energy (DOE) National Energy Technology Laboratory (NETL) and Hitachi High-Technologies America, Inc., to improve assessment methods for estimating the storage capacity of carbon dioxide (CO2) in tight shale formations, such as the Bakken. The project is funded by NETL with cost share provided by Hitachi. “Although significant progress has been made globally to investigate the suitability of subsurface geologic sinks for CO2 storage, there is a lack of detailed geologic and petrophysical data needed to develop better techniques for assessing CO2 storage resources within unconventional formations,” said Bethany Kurz, EERC Principal Hydrogeologist, Laboratory Analysis Group Lead. EERC researchers will develop advanced analytical techniques to better understand and quantify the distribution of clay minerals, organics, pore networks, and fractures in representative shale and tight rock samples. The analytical methods will be developed using imagery collected from a field emission scanning electron microscope (FESEM), which provides the high-resolution images necessary for detection and characterization of the formation. Project participant and cosponsor Hitachi High-Technologies America, Inc., will work alongside the EERC to improve the data processing and image analysis within the FESEM software. 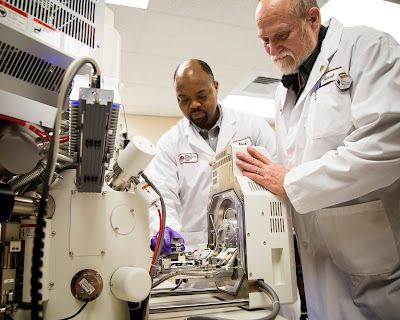 The effects of CO2 exposure on shale samples will also be analyzed by scientists at NETL’s CT Scanning Lab in Morgantown, West Virginia. NETL staff will also be involved to ensure that the project supports the goals of the Carbon Storage Program, which aims to improve the ability to predict CO2 storage capacity in geologic formations to within ±30%. More about Hitachi High-Technologies America, Inc. The EERC welcomes Shane Filipy as a Building Services Technician (BST) at the EERC, where he cleans and maintains specific areas of the EERC building complex. The quality and appearance of the EERC facilities have garnered many compliments from clients and visitors through the years, due in large part to the efforts of the Building Services team. Maintaining those high standards is something Shane and the BSTs do extremely well. “I like the décor of the buildings,” Shane said. 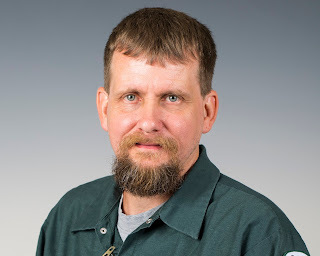 “I like the people I work with, and I have a great boss,” he said of EERC Building Services Supervisor Don Schaffer, who oversees the training, scheduling, and administrative aspects of the EERC’s Building Services team and their work. Shane has worked at the University of North Dakota (UND) for 2 and a half years. Before coming to the EERC, he first started in Building Services at the UND School of Medicine and Health Sciences. It seems Shane has always been drawn to jobs that require him to be detail-oriented. He was a supervisor at a car wash in Grand Forks for 23 years before he started at UND. Originally a native of Thompson, North Dakota, Shane has lived in Grand Forks for 36 years. Shane likes to go fishing and Frisbee (disc) golfing with his 16-year-old son, who is a sophomore at Red River High School. North Dakota ethanol producer Red Trail Energy, LLC (RTE) and the EERC have been awarded $490,000 by the North Dakota Industrial Commission’s Renewable Energy Program in support of a study examining the integration of carbon capture and storage (CCS) at a North Dakota ethanol facility to reduce the carbon footprint associated with ethanol production. “Using CCS to reduce the carbon intensity (CI) of North Dakota ethanol demonstrates the commitment of the industry to environmental stewardship as well as contributes to the long-term sustainability of ethanol production in the state,” said Gerald Bachmeier, RTE CEO. “CCS may be an economical option for reducing the CI of ethanol to qualify for market incentives by meeting low-carbon fuel programs in other states,” he said. The study will determine the technical and economic parameters of installing and operating a commercial CCS system at RTE’s ethanol manufacturing facility near Richardton, North Dakota. 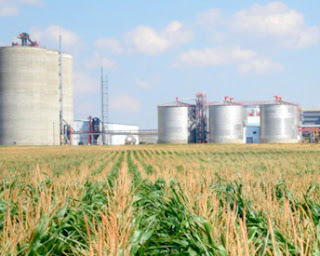 The facility produces approximately 63 MMgal of ethanol annually. The Broom Creek Formation, located approximately 6400 feet below the RTE facility, will be considered the main horizon injection point for potential geologic storage of the CO2. According to previous studies conducted by the EERC, this formation is expected to be an ideal storage horizon. “North Dakota ethanol producers are well situated to take advantage of these low-carbon fuel incentives because there is significant production capacity and ideal geology for carbon storage,” said project manager Kerryanne Leroux, EERC Senior Chemical Engineer, Oilfield Operations Team Lead. “The study will provide local ethanol producers with a detailed assessment of the commercial feasibility of utilizing CCS technology within their production operations,” she stated. More broadly, the project will provide a template for implementation within the state and promote North Dakota renewable energy production. The total project, with cost share, is valued at $980,000. U.S. Senator John Hoeven (R-ND) joined representatives from Minnkota Power Cooperative, ALLETE Clean Energy, and the EERC to formalize their partnership and sign a memorandum of understanding (MOU) to advance Project Tundra. Project Tundra aims to develop next-generation, advanced, full-plant scrubbing technologies to retrofit existing plants to capture CO2, which can then be sequestered or used in enhanced oil recovery. The MOU was signed by Al Rudeck, President of ALLETE Clean Energy; Mac McLennan, President & CEO of Minnkota Power Cooperative, Inc.; Wade Boeshans, President and General Manager of BNI Energy; and Tom Erickson, CEO. As a member of the Senate Energy and Water Appropriations Committee, Hoeven worked to secure $30 million in funding to help develop commercially viable carbon capture and sequestration, like Project Tundra, in the Senate’s fiscal year 2017 Energy and Water Appropriations Bill, which the Senate passed in May. Earlier this month, Hoeven arranged a meeting between North Dakota energy industry leaders and U.S. Energy Secretary Ernest Moniz to encourage the Energy Department to partner with the state’s industry to develop and implement commercially viable clean coal technologies and to make the case for the Energy Department to support Project Tundra as well as an Allam Cycle pilot project to develop technologies for new power plants. Hoeven also serves as a member of the Senate Energy Committee, where he continues working to advance the development and deployment of innovative technologies to improve the effectiveness and efficiency of the nation’s energy development. To this end, the senator worked to pass the Energy Policy Modernization Act of 2016, which includes legislation authored and introduced by Hoeven to help streamline energy regulations and address common problems faced by energy producers and consumers. The EERC welcomes Shane Butler to the EERC team as an Analytical Geologist, where he will work with clients to perform and interpret chemical and mineralogical analyses of rocks, clay, coal, and other materials using x-ray diffraction (XRD) and x-ray fluorescence (XRF) to develop and advance EERC analytical techniques related to unconventional oil and gas reservoirs, shales, and other tight formations. Prior to his position at the EERC, Shane served for 8 years as a Geologic Specialist with the Illinois State Geological Survey. Shane’s expertise includes identification of mixed-layer clay minerals in soil and rock samples; the coupling of XRD, XRF, and environmental scanning electron microscopy for the characterization of rock, soil, and mineral samples; the characterization of products for use in desulfurization systems for coal-fired power plants; investigations into flue gas desulfurization scrubber materials; travertine deposition and diagenetic alteration; and the use of cathodoluminescent microscopy and plane light microscopy. Shane earned his M.S. degree in Geology from the University of Illinois, Urbana-Champaign and a B.S. degree in Geoscience and a B.A. degree in Anthropology from Minnesota State University, Moorhead. “I started out as an archaeology major,” said Shane. “Then I became more interested in the rock and soil I was digging in and the importance it had in relation to archaeology. Lab science is one of those things where life throws a curveball at you. I had the opportunity to learn about XRD and mineralogy, expanded on my skills, and made a career of it." Shane and his wife appreciate Americana and retro culture and enjoy playing softball together, trying out craft beers and new breweries, going to Disneyworld, and walking their 185-lb St. Bernard named Fezzik and their 12-lb dachshund named Gertrude. “The little one is in charge,” he said. The EERC saw increased hiring during fiscal year 2016 (FY16), which ended June 30, 2016, with a significant rise in contract awards. Over the 12-month period, the EERC hired a total of 11 new full-time employees, which is the result of continued steady improvement in the overall financial health of the organization. In FY16, the EERC was awarded more than $36.5 million in new contracts, a 28.5% increase over the previous year and a 49% increase from FY14. Total contract expenditures exceeded $31 million, an increase of 7.5% from FY15. Over the course of the fiscal year, the EERC submitted 150 proposals worth $67.4 million to organizations worldwide. “This is the second year in a row that we have seen significant financial progress,” Erickson continued. 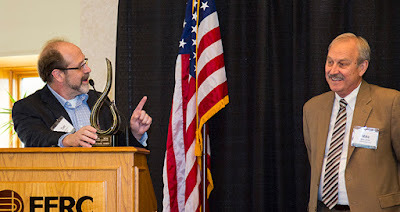 “Along with our success in awards, we launched a major internal reorganization focused on efficiency gains and aligning our core business activities, which has allowed us to meet the State Board of Higher Education's 3-year financial plan 1 year earlier than expected, regaining our self-sufficient funding model,” he said. With last year’s success, combined with nearly $25 million in contracts already awarded or under negotiation, FY17 is expected to bring a continued need for aggressive hiring. The EERC’s success is due, in part, to a new focused approach on developing programs and client relationships to solve the world’s most pressing energy and environmental needs, attracting significant federal, state, and industry support. 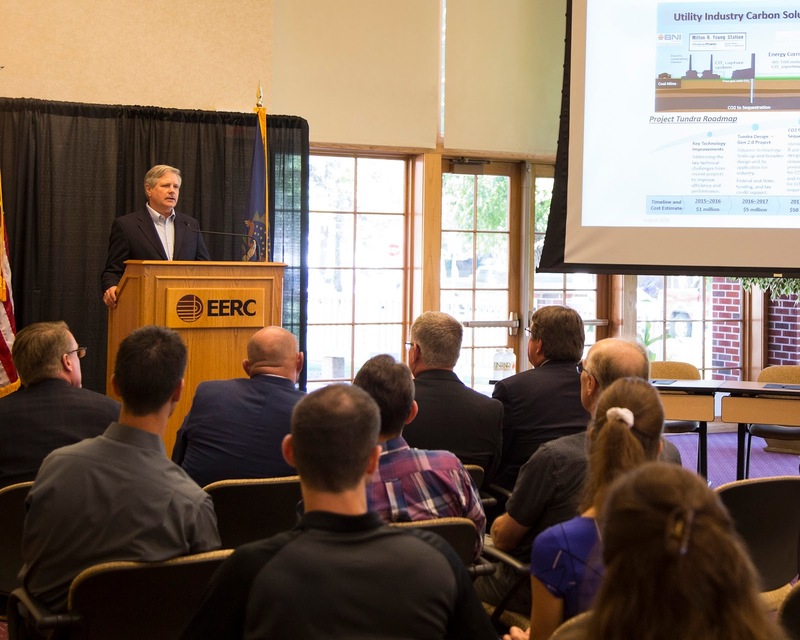 For example, the EERC has focused on the incredible opportunity that exists in North Dakota to bring together the synergies of coal, oil and gas, renewable, and agricultural industries, resulting in significant opportunity for the state. In FY16, the EERC received over $8 million in state awards to address current issues and enhance future energy opportunities for North Dakota. These projects demonstrate the EERC's commitment to serve the state of North Dakota and the businesses active in the state. Dr. Michael L. Jones, Vice President of Research and Development (R&D) for the North Dakota Lignite Energy Council, has been awarded the 2016 EERC Energy Champion Award. The award was presented in May 2016 during the Energizing North Dakota’s Future: Realizing the Vision luncheon held at the EERC. 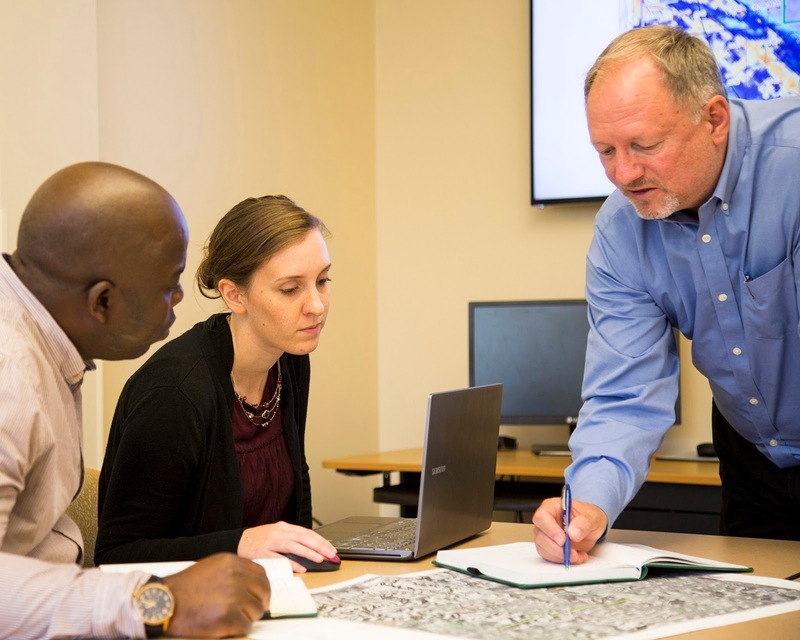 Dr. Jones began his career in the energy industry in 1979 when he joined the EERC’s predecessor organization, the U.S. Department of Energy Grand Forks Energy Technology Center, where he directed R&D projects related to combustion technology for low-rank coals. 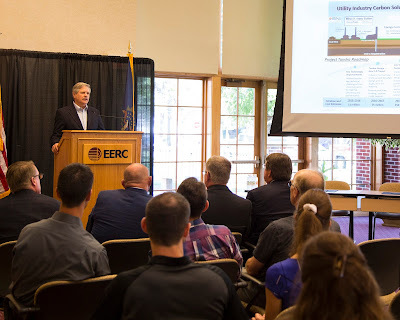 Following its defederalization in 1983, he continued with the University of North Dakota (UND) Energy Research Center, Energy & Mineral Research Center and, ultimately, the EERC, where he later became the Associate Director of Industrial Relations and Technology Commercialization. In 2009, Dr. Jones was appointed by the North Dakota Industrial Commission as Research, Development, and Marketing Director for the Lignite Energy Council and technical representative to the Commission. In 2014, he was appointed to the National Coal Council, which is the Federal Advisory Committee to the U.S. Secretary of Energy on topics related to federal policies, plans, and priorities affecting the production, marketing, and use of coal. Dr. Jones is a graduate of Bemidji (MN) State University, and he earned a master's degree and a doctorate in physics from UND. He has authored or coauthored over 80 publications. 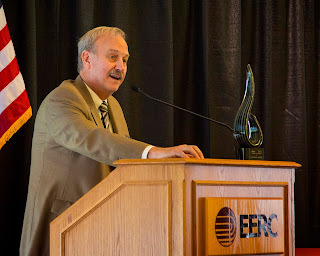 The EERC Energy Champion Award was created to honor individuals who have demonstrated extraordinary leadership, vision, and personal commitment to energy and environmental research, development, and demonstration programs across the nation. Past Energy Champion Award recipients include U.S. Senator Mark Andrews in 1986, Conrad Aas in 1987, John MacFarlane in 1990, U.S. Senator Kent Conrad in 1992, Thomas Clifford in 1993, Everett Sondreal in 1995, Thomas Bechtel in 1996, and U.S. Senator Byron Dorgan in 2004. The EERC is pleased to announce that Dr. César Barajas-Olalde has joined the EERC team as a Senior Geophysicist. In this position, César analyzes the subsurface using geophysical methods and performs advanced processing and interpretation of geophysical data collected in the field, providing clients with new ways to view the geology between wells or where there are no wells. 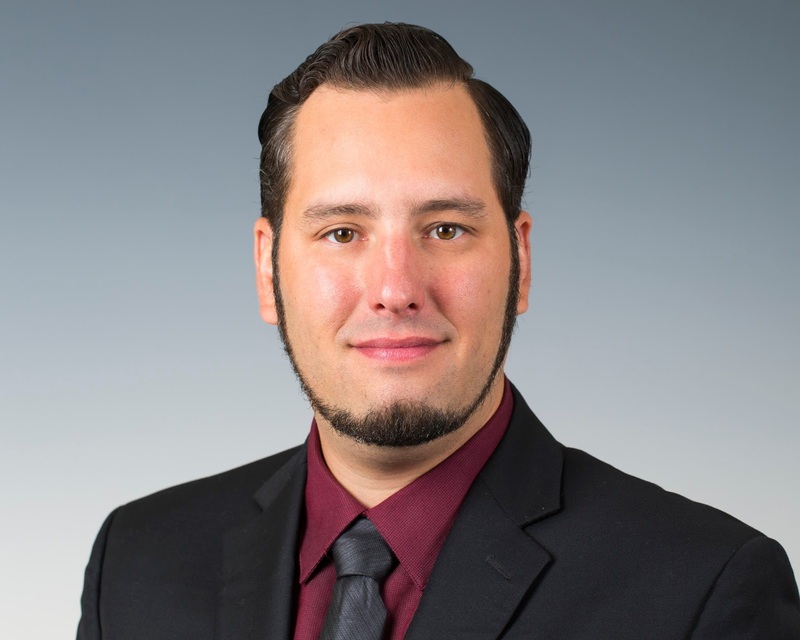 César specializes in the use of geophysical methods for exploration and monitoring of petroleum reservoirs and CO2 storage, geophysical data acquisition and processing, modeling, algorithm development, and the handling of large seismic data sets. 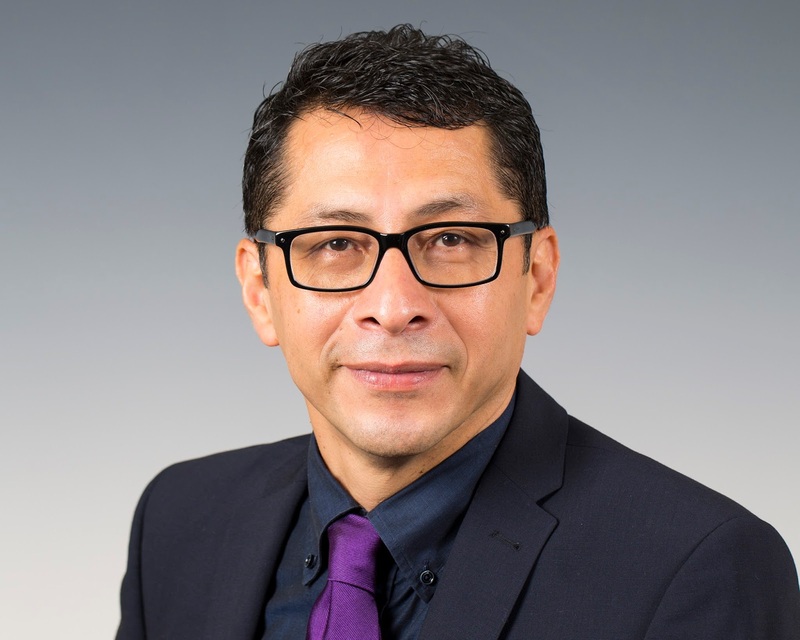 César brings a wealth of experience to his position at the EERC, having worked for Schlumberger most of his career in several R&D positions in Houston, Texas; Dhahran, Saudi Arabia; London, United Kingdom; and elsewhere. César also has worked in production environments as Geosolutions Data Processing Manager based in Buenos Aires, where he was accountable for Schlumberger Geosolutions’ strategic direction across Argentina, Bolivia, Colombia, and Venezuela. Most recently, as Project Manager for Schlumberger Geosolutions Center in Denver, Colorado, César spearheaded a mega seismic data-processing project in which leading-edge technology was applied to petabytes of data. César holds a Ph.D. degree in Geophysics from the University of Kiel, Germany; an M.S. degree in Applied Geophysics from Ensenada Center for Scientific Research and Higher Education, Mexico; and a B.S. degree in Geophysical Engineering from the Technological Institute of Ciudad Madero, Mexico. César understands well the challenges of handling, analyzing, and processing “big data,” and his experience working in R&D and production environments with stakeholders worldwide has involved the development of technology from inception to final application within the commercial market. This expertise and his experience working with reservoirs worldwide are great assets to the EERC. “My exposure to geophysical challenges of reservoirs such as Ghawar in Saudi Arabia, Burgan in Kuwait, and Vaca Muerta in Argentina will allow me to rapidly identify the technology required to address the challenges of the reservoirs in the Williston Basin,” said César. César and his family love music, traveling, and participating in sports. Originally from northeastern Mexico, César’s interests outside work involve learning as much as possible about the places and cultures where he lives. He spin-cycles, plays tennis, ran his first half marathon last year and plans to run a full marathon, and played golf for the first time at the EERC Golf Tournament this summer. While in Saudi Arabia, César created a soccer training program for kids and coached a children’s team there. He wants to do that again.